When deployed in a potentially hostile environment, security-critical devices are susceptible to physical attacks. Consequently, cryptographic implementations need to be protected against side-channel analysis, fault attacks and attacks that combine both approaches. CAPA (CRYPTO 2018) is an algorithm-level combined countermeasure, based on MPC, with provable security in a strong attacker model. A key challenge for combined countermeasures, and CAPA in particular, is the implementation cost. 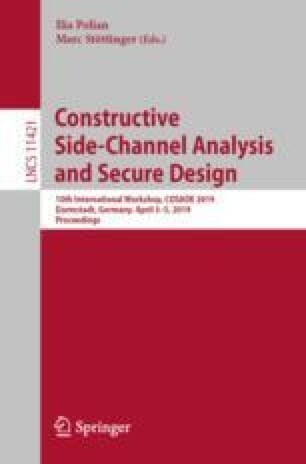 In this work, we use CAPA to obtain the first hardware implementations of Keccak (SHA-3) with resistance against combined side-channel and fault attacks. We systematically explore the speed-area trade-off and show that CAPA, in spite of its algorithmic overhead, can be very fast or reasonably small. In fact, for the standardized Keccak-f instance, our low-latency version is nearly twice as fast as the previous implementations that only consider side-channel security, at the cost of area and randomness consumption. For all four presented designs, the protection level for side-channel and fault attacks can be scaled separately and to arbitrary order. To evaluate the physical security, we assess the side-channel leakage of a representative second-order secure implementation on FPGA. In addition, we experimentally validate the claimed fault detection probability. The authors would like to thank the COSADE reviewers for their helpful comments. This work was supported in part by the Research Council KU Leuven: C16/15/058 and by the NIST Research Grant 60NANB15D346. Lauren De Meyer is funded by a PhD fellowship of the Fund for Scientific Research - Flanders (FWO). Antoon Purnal would like to thank Vincent Rijmen and Ingrid Verbauwhede for supervising the master’s thesis that led to this paper.